Today had been planned for catching up with friends and colleagues in and around West Lafayette. We made sure that we were awake earlier than yesterday, ate breakfast, and we’re out the door shortly after 8:30 am for our first engagement. When we were living in West Lafayette, probably on our first Sunday when we attended mass at Blessed Sacrament parish, we met Joe and Barbara Krause over coffee and donuts that were part of the regular Sunday routine at the parish. They were part of a small group with whom we shared conversation over coffee most Sundays and with whom we spent a weekend at Saint Meinrad Archabbey shortly before we left to return to Australia in May 2002. When we were planning our trip we decided to try to catch up with some of the folk from the parish and I managed to track down Joe via LinkedIn. Appropriately we had arranged to meet at the church at 9:00 am today. From there we followed them to Christos where we had coffee and enjoyed catching up on news of family, shared friends, and other matters for a couple of hours. For a while it seemed that little time had passed since we were last here. From there we headed just down the road to Purdue where I had arranged to meet with former colleagues, Tim Newby and Jim Lehman, and they had generously offered to take us to lunch. We thought we had left Joe and Barbara with plenty of time to park at Purdue and make our way to Tim’s office but we had not reckoned with the extra crowd of visitors on campus for a careers fair. The parking garage available to visitors was full – we drove all the way to the top level and down again without finding a vacant space. We were not alone with that experience – a steady procession of cars seemed to be following the same sorry path. We drove around the campus a bit but the other garages and spaces on the streets required a permit that we did not have. Eventually we found a space on a street just off campus that allowed 2 hours of parking. I called Tim to say we were on our way (already more than 5 minutes late with a walk of at least that to meet them), set a timer on my phone to ensure we dealt with the 2 hour limit, and we headed off. On the way into Beering Hall where the Education faculty offices are located we bumped into Aggie Ward, the assistant to the Educational Technology group. She was bustling off on some errands so we said we would catch her after lunch. Tim and Jim were waiting for us when we got upstairs and after greetings we headed to the John Purdue Room in the Marriott building where the hospitality students gain experience working in a restaurant supervised by faculty. Lunch there was very good. Majella had the Indiana salad with Tuscan bread while I had Prosciutto Pete (Purdue Pete being a Purdue mascot) which had prosciutto and salad on focaccia bread accompanied by a cup of fruit salad. Both were very good. Conversation ranged over a variety of topics including the incoming president at Purdue (current but retiring state governor), grandchildren, online courses at Purdue and USQ, travel, and more. We had a very enjoyable hour of catching up before Jim had to go to a meeting. We walked back to the faculty office with Tim and spent some time visiting with Aggie, talking about our respective kids and grand kids. We made it back to our car with a few minutes to spare of the 2 hour parking limit. From there we headed toward the shop, Twice as Nice, where Sue was working to see her once more. Majella appeared to line up incorrectly for an intersection in the downtown area and was forced to go left instead of straight ahead. The ‘coincidental’ consequence of that was that we had to drive along Main Street past the candy store that she remembered when she saw (closed) on Monday evening and had wanted to visit. We stopped to buy some candy before going on to see Sue. Majella found some treasures there too, including a jacket that she thinks will be just the thing for a trip to the theatre in New York. Next stop was our motel to deposit Majella’s chocolate so that it would not melt any more than it already had. From there we made a fruitless trip to Shadeland to visit the quilt shop that we had tried to find yesterday. I’d managed to locate it on Google Maps, a bit south of where we had looked yesterday. When we arrived there we remembered the old church in which it had been located but the quilt shop was nowhere to be seen and the church was now a private residence. If others had the same trouble finding it that we had I can understand why it did not survive. We returned to base to rest until it was time for dinner with Heather and Broc Servaty at their home just south of Lafayette. Heather works at Purdue and Majella met her when she volunteered on a project working with bereaved youth while we were here. Heather was directing the project and still works in the same area of psychology. She and Brock, a computer engineer developing his own projects and doing some consultancy, came to Australia with their two young daughters when she had sabbatical in 2009. Majella had helped them to arrange a housing exchange with Peter and Bernie Cronk and we had dinner with them while they were staying there. Broc had prepared a dinner worthy of a restaurant with salmon crusted with spices, spinach salad with tomatoes, cheese, and figs, and quinoa cooked with spices. That was all delicious washed down with Marlborough Sauvignon Blanc. They had visited New Zealand while on their Australian trip and my offering complemented theirs. Dessert was watermelon and berries that Clara, their older daughter, had arranged artfully in a tower. Conversation ranged widely over family, grandchildren, travel, computers, and education. It was a very enjoyable evening and a fine way to finish our visit to Lafayette. 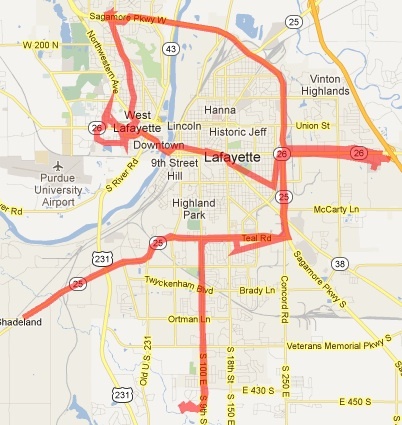 Distance today around Lafayette was about 85 km. Tomorrow will be a much bigger day for travel. We enjoyed our brief “coffee break” with you at Christo’s yesterday (September 12) morning. It was especially interesting to learn about the bishop who was removed merely for speaking plainly. We admire your adventuresome spirit as you plan to tour much of the eastern half of the United States and even parts of Canada ! It was good to see the pictures of such a lovely, thriving family on that clever up-to-date device. Much better than a clumsy and heavy album. I suppose it is a sign of the future. You both appear healthy and wise. Forget about the wealthy after this trip, but, on the other hand, you did mention the favorable exchange rate. We are happy that you are able to take advantage of it. Please drive carefully as you visit many other places in the U.S. Let GPS help you, but rely, foremost, on common sense. Which, now that I think of it, isn’t so common any more. Joe and Barbara in West Lafayette, Indiana.